Disabled campaigners have called on parliament to press for new laws that would allow candidates to stand jointly for election as job-share MPs, after a judge threw out a legal case brought by two members of the Green party. Disabled activists believe that allowing more than one person to job-share as an MP would increase the number of disabled people and women represented in parliament. Both the Greens and the Liberal Democrats have endorsed the idea, and the Lib Dems included it in their general election manifesto. But the high court this week rejected an application by Green party activists Clare Phipps and Sarah Cope, who argued that they should have been allowed to stand together for election to the Basingstoke seat at May’s general election. The court said the law was clear that only single candidates could stand for election as an MP. Neither Phipps nor Cope would be able to serve as a full-time MP because Cope is the main carer for two young children, and Phipps has an impairment that prevents her working full-time. Deborah King, co-founder of Disability Politics UK, which campaigns for MPs to be allowed to job-share, said she was “disappointed” by the court’s ruling, although the judge had recognised the “important social and political issues raised by the case”. King plans to write to the political parties and the Commons speaker John Bercow to ask for his inquiry into parliamentary representation to be re-opened, so that it can hear evidence on “how job-sharing for MPs would work in practice”. Bercow’s Speaker’s Conference reported five years ago on how to increase the number of disabled, female and minority ethnic MPs, but did not back the idea of job-share MPs. Dr Sarah Wollaston, the Conservative MP for Totnes, who has worked as a job-sharing GP, has said she would be willing to give evidence to such a conference. King said the 2015 Conservative manifesto included pledges to increase the number of female MPs, and to remove the barriers to workforce participation faced by women and disabled people. She said: “Enabling MPs to work part-time would be a removal of a barrier to work for many people. 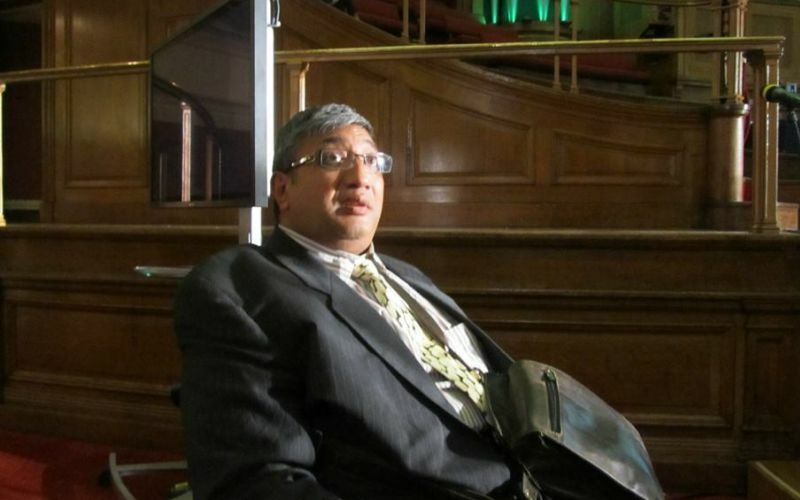 Adam Lotun (pictured), a disabled activist who was rebuffed in his attempts to stand at the general election as an independent job-share candidate in the north London constituency of Hackney North and Stoke Newington constituency, said he was “disappointed” with the court’s ruling. In its report on May’s general election, the Electoral Commission says it received “several queries” in the run-up to the election about whether “two or more people could jointly stand for election as MP for a constituency and share the role between them”. But the commission says it told those who raised the question that election law “only allows for a single individual to be returned to a constituency for the UK Parliament”, and that the government would need to introduce changes to legislation in order to allow job-share candidates. The legal firm Leigh Day, which is representing Phipps and Cope, said no decision had yet been reached on whether to appeal the high court’s decision.